I came upon this antique paper weight years ago as a part of an auction box lot, and just now found it in drawer I was cleaning out. 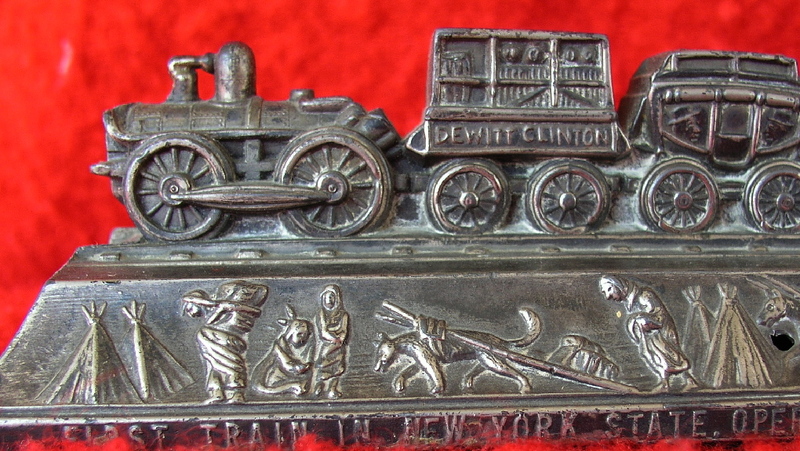 It is a white metal casting paper weight commemorating the first run of the Mohawk and Hudson Railroad which was the first railroad built in the state of New York, and was one of the first railroads in the United States. It was so-named because it linked the Mohawk River at Schenectady with the Hudson River at Albany. It was conceived as a means of allowing Erie Canal passengers to quickly bypass the circuitous Cohoes Falls via steam powered trains. The railroad was incorporated on April 17, 1826 as the Mohawk & Hudson Company and opened for public service on August 9, 1831. On April 19, 1847, the company name was changed to the Albany & Schenectady Railroad. 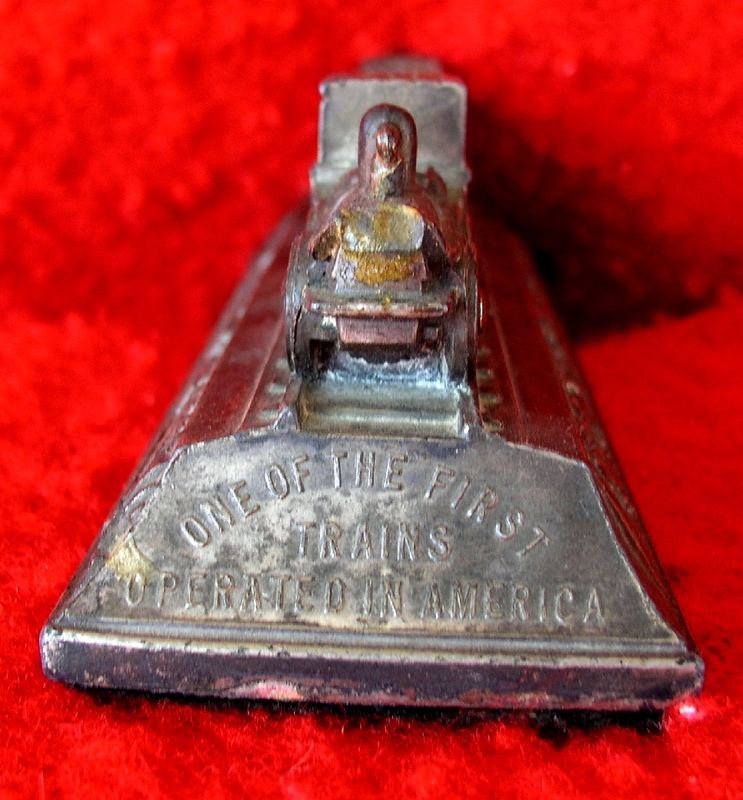 In searching on the internet I was able to find lots of information on the railroad itself but nothing on this souvenir. I don't know if it was issued as a souvenir to the first passengers, or was made at some later anniversary date. It just appealed to me because of the imagery and design. You can see in the close up that therre is a small hole on one side which appears to be a casting error. 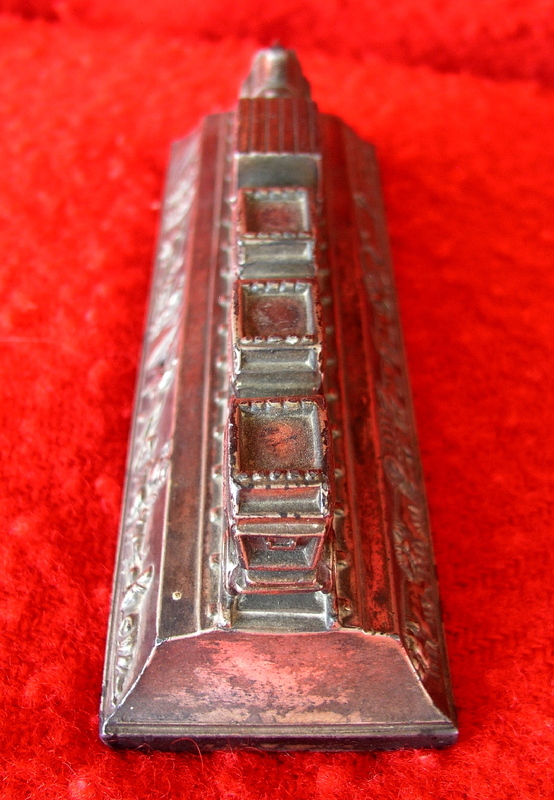 It is 7" long, 2 1/4" wide, and 2" tall. There is black felt attached to the base. It looks just like the illustrations of the actual railroad. If you click on the photo it will open up to full size.